Lies, lies, and Lebanese lies. The Camera does lie. Reuter’s has had to withdraw all of its photos from one of their sources (now an ex source) in Lebanon, a Muslim gentleman by the name of Adnan Hajj. He had been found to be doctoring photos to make the damage done by Israeli forces look more extensive than it actually was. It’s not the only type of fraud by photo that has occurred either. Here’s another recent example. A photo in Beirut, dated 24th July 2006, shows a clearly identifiable scene, with one of the buildings having been flattened. The story tells us that “Journalists are shown by a Hizbollah guerrilla group the damage caused by Israeli attacks on a Hizbollah stronghold in southern Beirut, July 24 2006. (Adnan Hajj/Reuters)” But then what’s this? 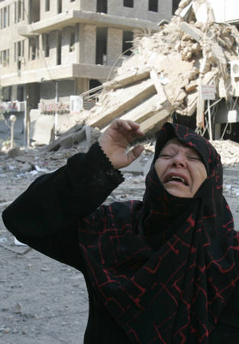 Later, on August the 5th, a different photo of the exact same spot with a woman walking past is released, and we are told “A Lebanese woman looks at the sky as she walks past a building flattened during an overnight Israeli air raid on Beirut’s suburbs August 5, 2006. (Adnan Hajj/Reuters)” That’s either some really fast rebuilding, or some super fast talking. But it doesn’t end there. Have you seen this woman before? 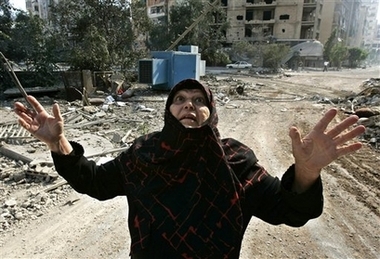 Here’s what we are told this time: A Lebanese woman reacts at the destruction after she came to inspect her house in the suburbs of Beirut, Lebanon, Saturday, Aug. 5, 2006, after Israeli warplanes repeatedly bombed the area overnight. (AP Photo/Hussein Malla) (from Yahoo News) There’s no propaganda like free propaganda. Hezbollah have more than they need with the combined force of Reuter’s, Allied Press and Yahoo, along with anyone else who publishes whatever Lebanese correspondents who are party to the conflict give them. Why are so many Palestinian children dying? Are Jew seeing what I’m seeing in New Zealand political propaganda? Disagree with a Muslim in public? Then you're a criminal. Presbyterian Church states the obvious, and the media lies about it. Same old. Previous Previous post: Victoria University’s advertising team are a bunch of lying liars!